Createspace Independent Publishing Platform, 9781496145864, 226pp. MISTAKEN KISS was written as a tribute to two of my favorite authors: the brilliant Oscar Wilde and the incomparable Georgette Heyer. 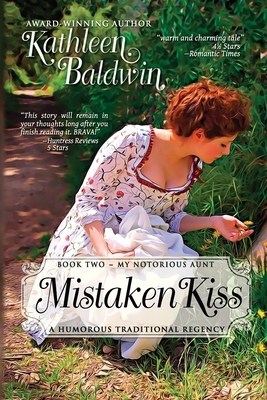 I hope you will enjoy this light-hearted Regency romp as much as I enjoyed writing it. Devious Aunt Honore is back, and she's up to her pin curls in mischief. Rather a crafty slyboots in this Regency romantic romp, and I must confess I miss writing about her. Luckily, the old gal will be back in book three, CUT FROM THE SAME CLOTH, another Regency Romantic Comedy. Available on Author Kathleen Baldwin's website.